If you think way back to your old science lessons at school, you may remember using a prism to separate white sunlight in a rainbow of colours. Anyone who paid enough attention back then may also remember that white light is made up from three distinct colours. Red, Green and Blue. The CR-Z Hybrid car from Honda has three distinct driving modes, each symbolised graphically as the dashboard lights switch between the colours of each mode. Red for "Sport", Green for "Econ" and Blue for "Normal". Under the visionary direction of Frank Budgen, the 60 second TV and cinema ad simply titled 'RGB', portrays the driver or passenger's point of view as he or she drives through a modern city, in this case Barcelona. Our lead flame Barnsley explains: "For each of three driving modes, the colour palette of the image changes very graphically, as the tone/drone of the sound switches between different pitches, one for each mode. 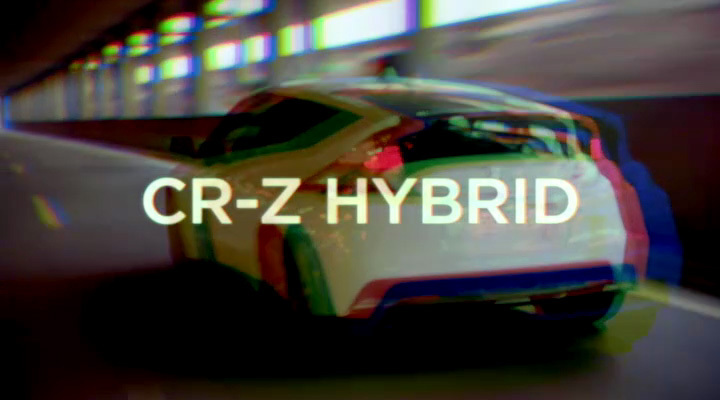 The final shot sees the CR-Z car forming from the three split/fractured channels to show a white car driving off into the light."